Thursday is now my long run day. I’m still trying to get use to it. I didn’t sleep well last night so I was glad to have a break from my bootycall workouts. Got up, ate breakfast and then got the boys ready for school. Not my best run, but I did it. Turbo Fire Day 80– I didn’t know how I was going to do Fire45EZ but I made myself do it. I gave it every bit of energy I had left. I’m glad that there are no fire drills in this one because I doubt I would have survived a HIIT drill. I followed it with Stretch10 which felt amazing. My legs really needed a good stretch. I did do a 2min plank for PlankADay before bed. Broke this up into 30sec: plank, side plank (each side), plank. M1: MapleNut Oatmeal w/ unsweetened almd milk, almd butter, blueberries and chia seeds. M3: Chocolate Shakeology w/ Chocolate Zico, spinach, mango and pineapple. 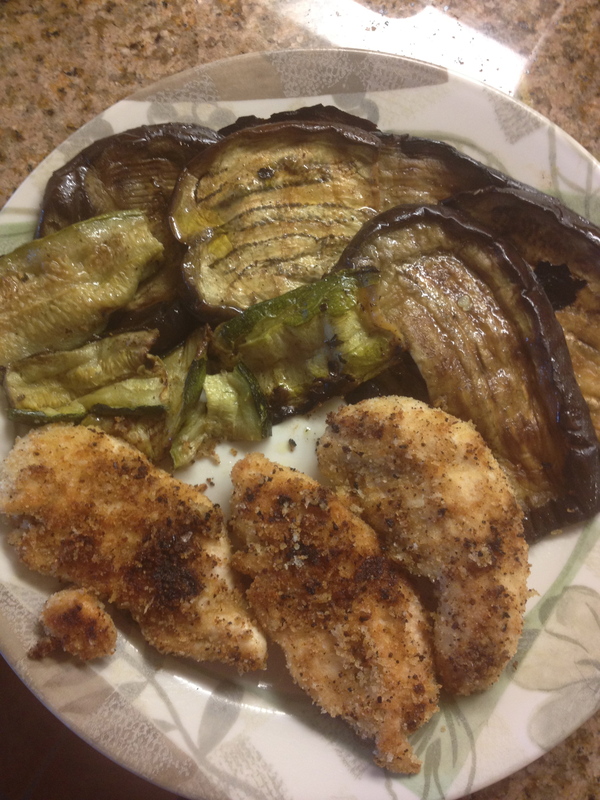 M5: Panko Chicken with left over grilled eggplant and zucchini. Saturday was Ben’s first day back to his normal work schedule :-) And now that Big Sur is done, I’m going back to my normal workout schedule this week. Took it easy because I was super tired. Ben has a rotating shift, his hours change daily so I have to work around his schedule to get my workouts in. It’s not ideal or perfect but I do what I gotta do. I’ve decided to change my long run day to Thursday because that’s when both boys are at school and I can train uninterrupted :-) I’ll be starting my half marathon this week and finishing up my Turbo Fire. For the next couple weeks, Saturday mornings will be dominated by the boy’s tball games. I didn’t get a chance to workout again until before dinner time. Turbo Fire Day 75 – I used up a lot of energy doing HIIT25. I really really focused on getting my knees up for the tuck jumps. Those are so hard and there are so many in this one! lol. But I am getting better at them. Sculpt30 really works my arms out. My shoulders and biceps always burn with this workout. Ended my day with a 3min plank alternating with low, side, and high. 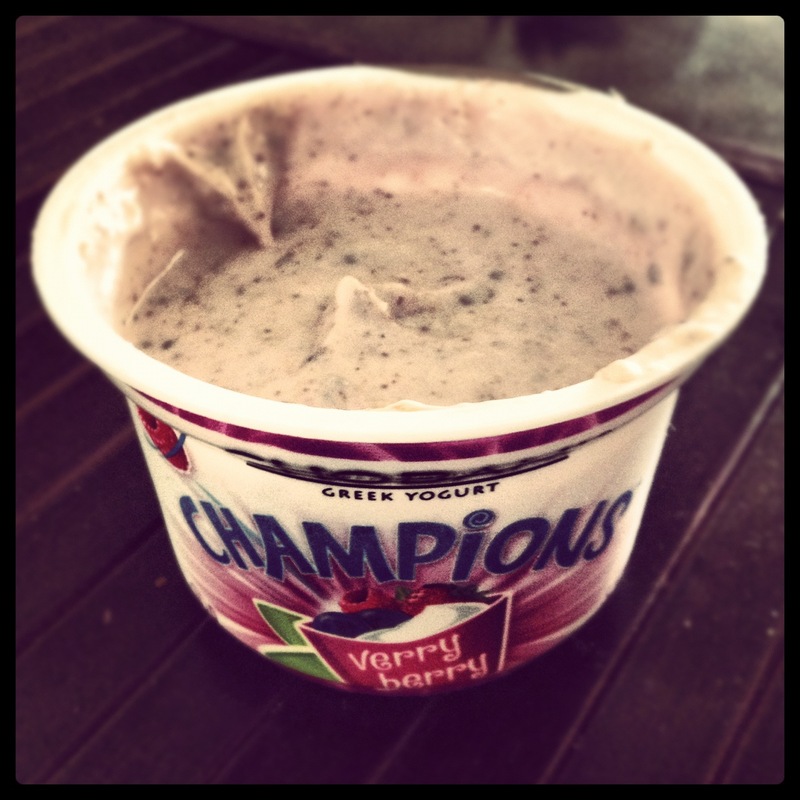 M1: Chobani Champions Very Berry with Chia seeds and almond butter. M2: 5 dark choco almonds. 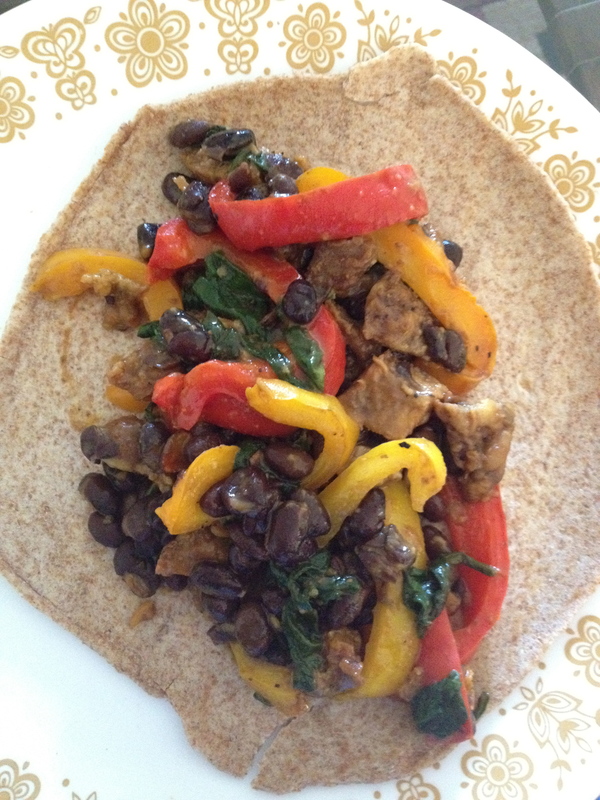 M3: Left overs pork/black beans/veggies wrapped in whole wheat tortilla. Plus 2 clementines. The second one was a little bit bigger. M4: Roasted Seaweed and half a mango. Quiona and black beans is one of my favorites. Turbo Fire Day 76 – I did Fire30 for my afternoon workout. I’ve gotten so much better with the fire drills and doing the tuck jumps. I’m still not as good as the people on the DVD but I can get my knees up a lot higher :-) I’ve also gotten better with the kicks. I jumped in between all the high low combos. It never fails to get me sweating. Followed with Stretch 10. The deal was that I’d take the boys to the pool after my Turbo Fire workout. They were very good and played in their room while I worked out so I took them to the pool so they could get their exercise in :-) I’m so glad that the weather is warmer now. We will be at the pool a lot from now on. I didn’t swim but I plan on incorporating swimming into my workouts soon. 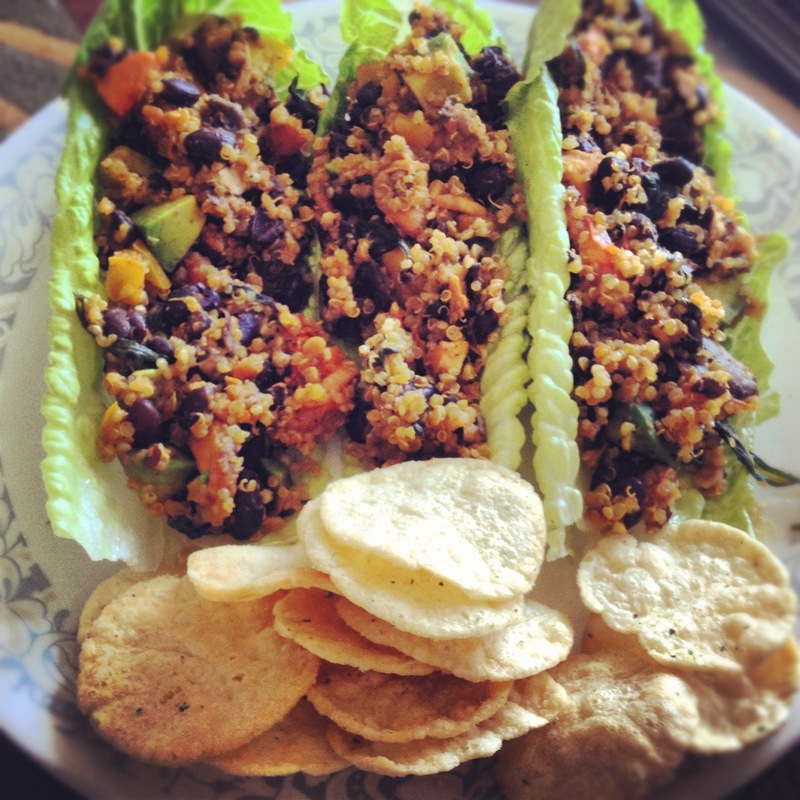 M3: Quinoa/blakbean/ veggie mix lettuce wraps and Pop Chips. Leftover lettuce wraps and pop chips. 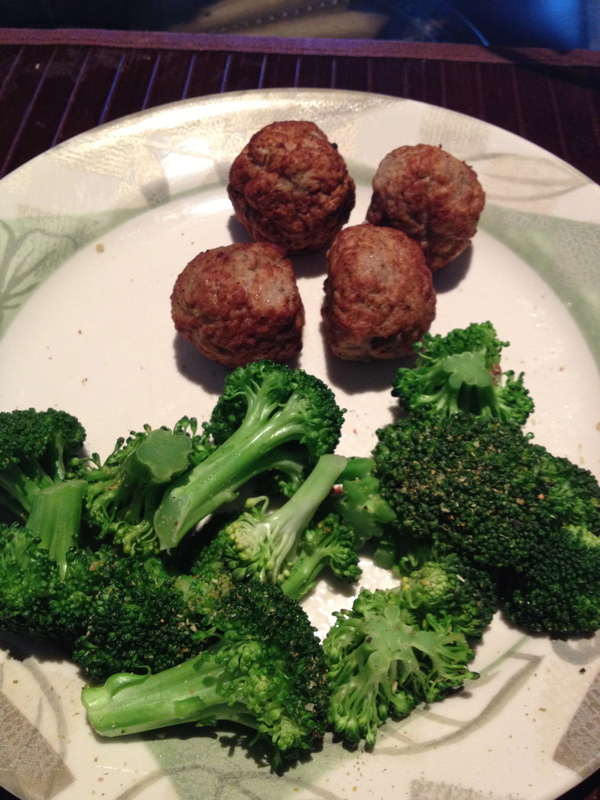 M5: Turkey meatballs and broccoli. 60 oz. of water and 1 Zico. I love doing plank to workout my core. 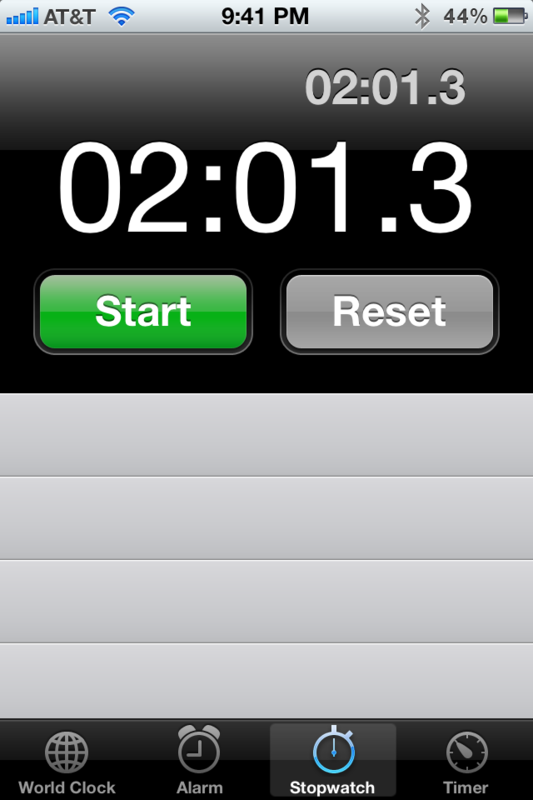 I’ve been doing pretty good with the PlankADay challenge – doing a plank once a day. 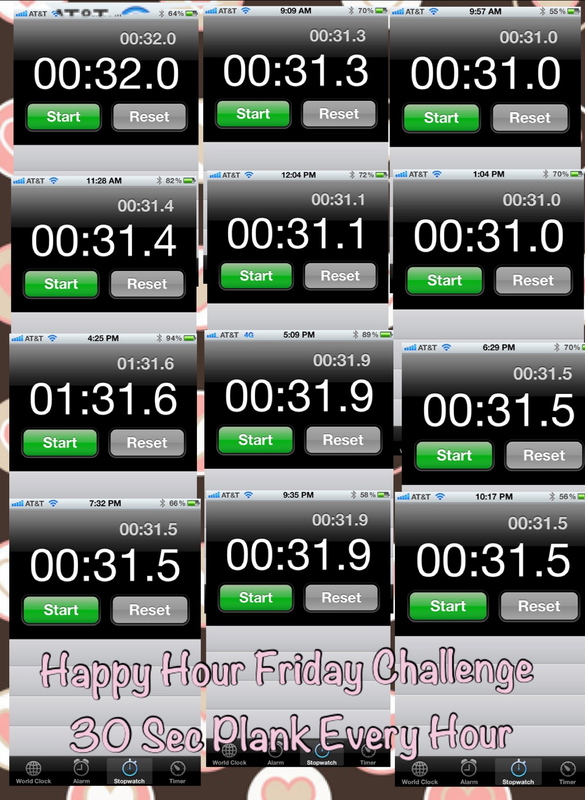 Today was Tone It Up’s Happy Hour Friday Challenge – you can find it on their monthly calendars :-) For this week, it was 30 reps of any exercise. I really couldn’t decide what to do when I got up this morning. I kept going back and forth between plank and pushups. I went with a 30 second plank :-) Headed out for a 3 mile run for my bootycall and started the happy hour challenge at 8a. Made it through 1p before I missed 2p and 3p. To make up for it I did a 1:30 plank. Turbo Fire Day 74 – Part of the reason I missed the planks at 2p and 3p was because I did my Fire55EZ workout. I did all the jumps, tuck jumps, and jacks. I accidentally chose to Fire Up the music so I couldn’t hear the cues as well but I only fell behind a couple times. It was fun with the music turned up though :-) I think once I have the routine memorized and don’t really need the cues, I’ll be firing the music up again. The Bikini Series Challenge was to do the Drop10 Slim Spin – 40 minutes of my favorite cardio. It was already dark when I could finally do it. I almost decided to skip it and do it for my bootycall tomorrow. But headed to the gym anyways. I’m not really sure I’d be able to head outside for my bootycall tomorrow either. 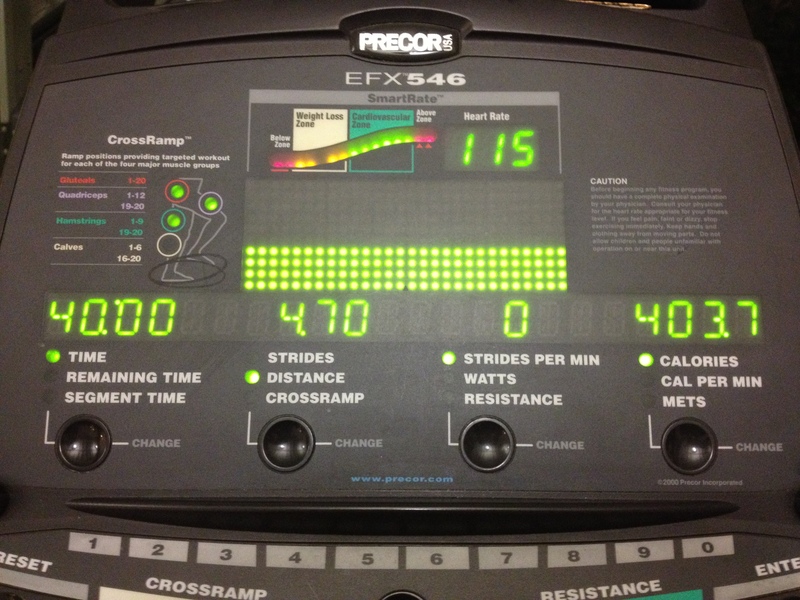 My knees were really tight so I went to the elliptical. I did a cross training program that had me pedal backwards and forwards. It was different going backwards but I liked the change up. M1 – Multigrain raisin oatmeal with banana, almond butter, and chia seeds. M4: Dark Choc Cherry and Cashew Kind Bar. 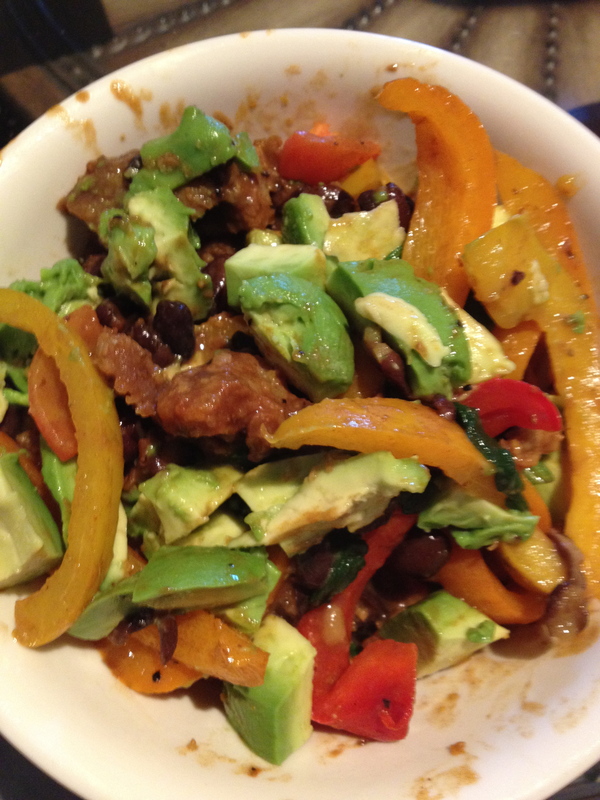 M5: Peppered Pork, bell peppers, and black beans mixed together topped with avocado. 60 oz. water. 1 Zico. I could feel the Bikini Bootcamp workout from yesterday when I woke up this morning :-/ Sore legs and sore chest and I’m happy about it :-) It means that I really worked hard yesterday. I’ll have to do that one again soon. Despite being sore, I got up to do a 40min bootycall. I did Under the Seax3 and Beach Bumx3. These were tough with sore legs. Afternoon workout was a 5 mile run. Ended with a 3min plank. 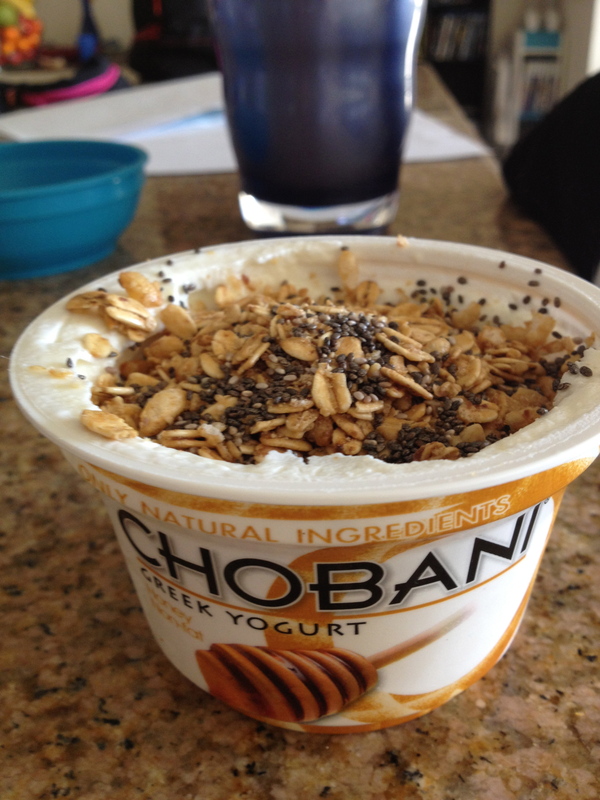 M1: Chobani Honey with granola and chia seeds. This was the regular size and it was sooo filling. 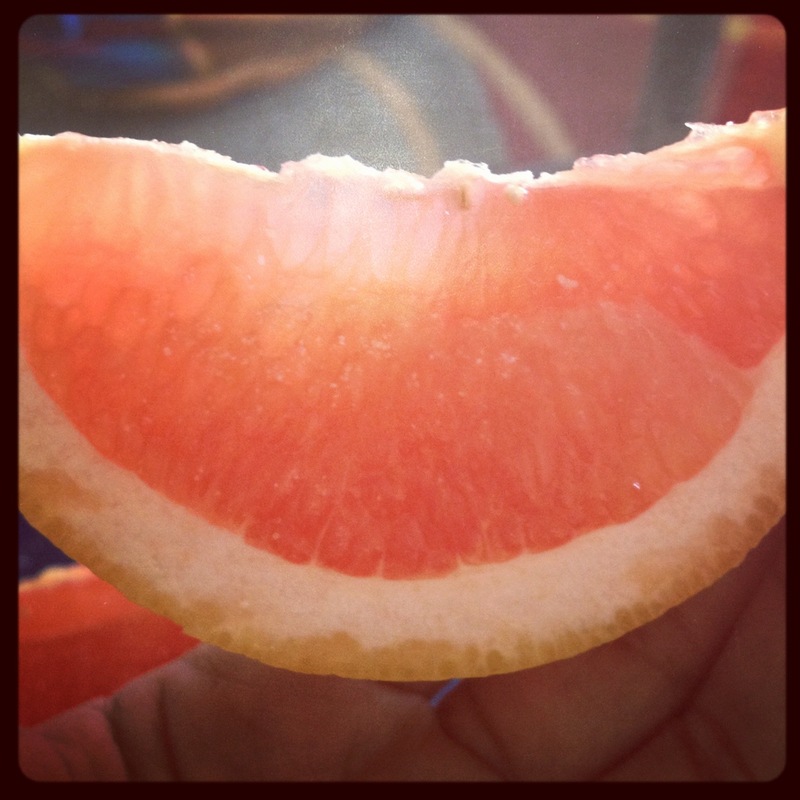 M2: Half a grapefruit with stevia. M3: Chocolate Shakeology with unsweetened almond milk, spinach, and frozen blueberries. 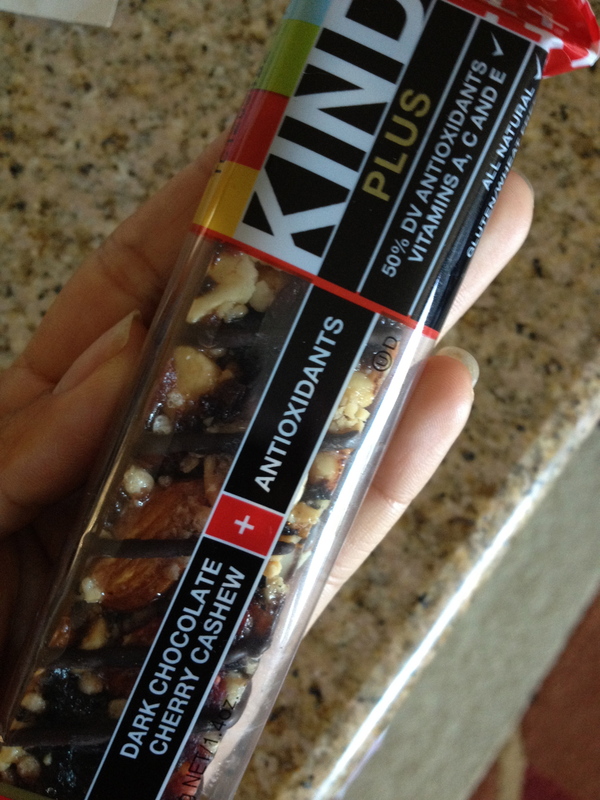 M4: Almond Coconut Kind Bar. 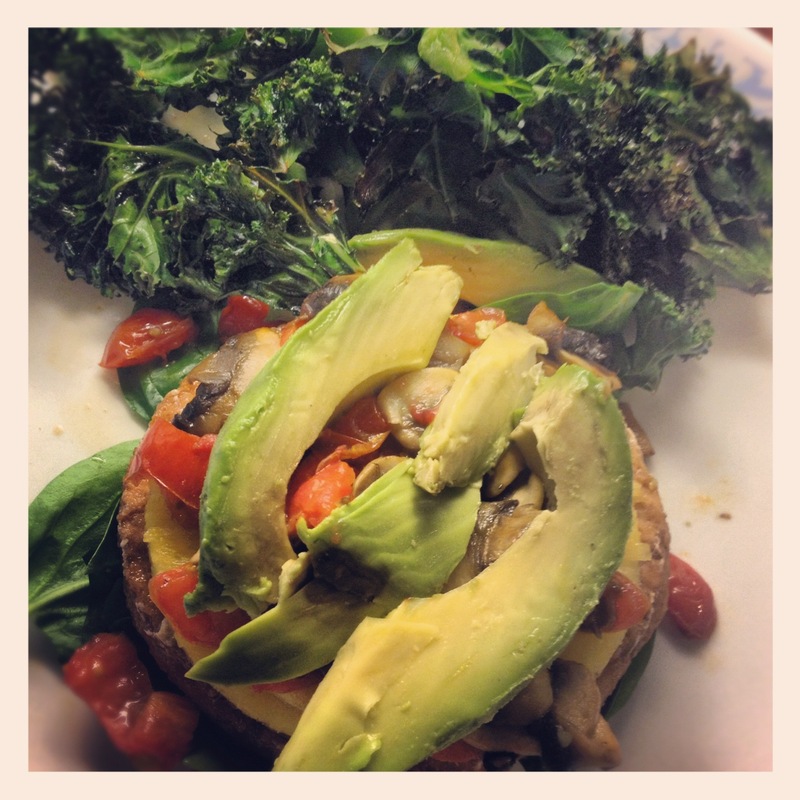 M5: Salmon Patty topped with fresh pineapple, mushrooms, tomatoes, and avocado on top of spinach with a side of kale chips. BeachBody Day72 – Sunday – Big Sur International Marathon!! Love quinoa and red sauce. It was a little cold at the start of the race. Wore my Asics running shoes. Love my ceramic finisher medal. First guy who ran 26.2 miles carrying a flag! Second guy with a flag! I thought running the marathon would be hard enough! Can’t believe this guy ran a marathon with all those balloons! Pretty flowers by the finish line. Traffic on the drive home :-/ ugh!! I was able to get my shirt the morning of the race :-) Smallest size they had was a medium but I took it! Our morning started early. My aunt’s 21miler had her up at 3a :-/ We did not envy her. She said that she didn’t sleep for more than a couple hours because she was nervous. And despite that she still beat her training time and came in under 4 hours! Way to go Aunt San!! My sister’s 5K and my 9miler started at the same time. We were up at 5a. We got dressed and packed up because my aunt had already checked us out when she left for her race. At first I thought her race would start before mine. We were happy to be able to start together. 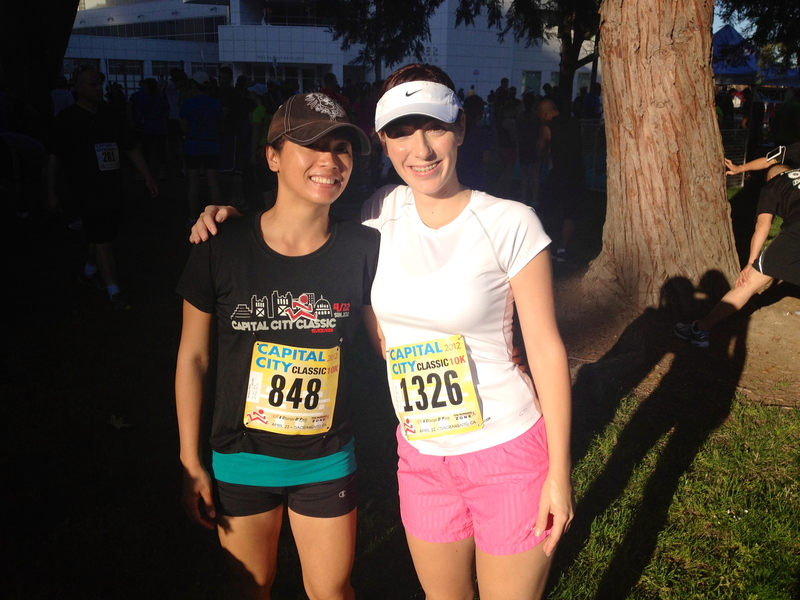 My sister ran her whole 5K – which she hadn’t planned on doing because of her hip – and beat her expected time too. I am so proud of both of them. I was separated from my sister early on. I tend to get very focused and just run. Our courses split after a run on a trail by the water. It was just so beautiful. I wish I could have stopped to take pictures and just take it all in, but I had to keep running. It was 50 degrees and overcast when we started. I really couldn’t have asked for better weather. It’s what I’m use to running in. What I wasn’t use to were the hills :-/ I knew that there would be some hills, but I wasn’t expecting it to be hill after hill. lol. Not that they were all big hills, but it there wasn’t all that much flat areas. It would level off and then I was going either up or down again. I could definitely feel my booty getting worked! I didn’t run with music because I wanted to enjoy the course. There was plenty of entertainment. There was a Samba band, a flute player, a guy playing the bag pips, a band singing, and people cheering you on all through out the course. It also helped that there was just beautiful scenery throughout the course. The beginning took us through a really nice neighborhood in Carmel. I would love to live in one of those houses. 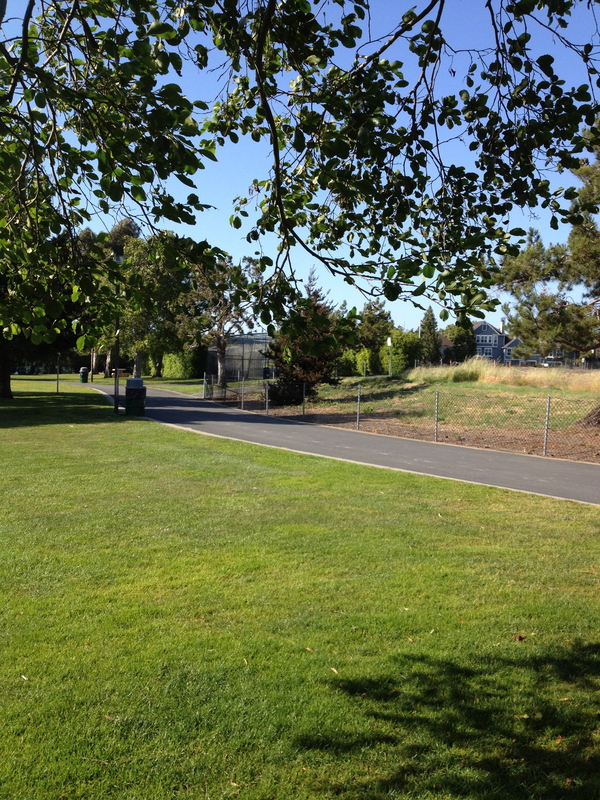 There were several ocean views and the run through the park was wonderful. It felt like I was running through my grandfather’s property. I had my phone in my belt so I didn’t see what my time or pace was. I had no concept of how time at all. There were only a couple mile markers that I could see. The 1 mile point and the 25mile marker which marked the last mile for all the courses. I felt like I was running slower because of the hills and that I was getting passed up. When I could feel it in my legs I was hoping that I was getting close to the end. During training, it was the last couple miles that my legs would start to feel tired and my knees got achy. This time, I could feel my booty and my calves too. I loved that there were people all throughout the last half mile cheering you on. It was so cute to see the little kids cheering. They also had cardboard cut outs that were funny. I could hear the announcer as I got closer to the finish line. I used everything I had left to go faster at the end. I almost couldn’t believe that I was done when I crossed the finish line. It didn’t feel like I had been running for over an hour. 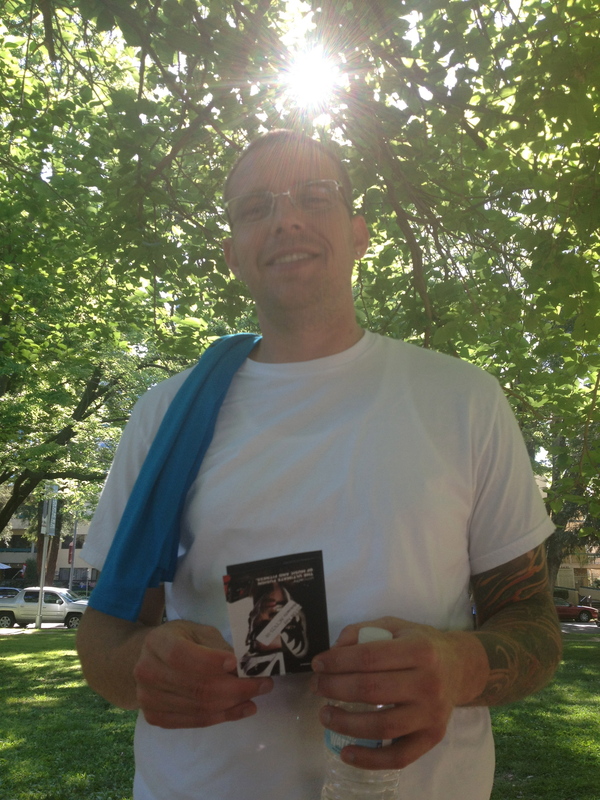 A girl came up to me and handed me a finisher medal and I wound up posing for photo. I was directed towards the tents and told to grab a brown paper bag and go. I took half a blueberry muffin that was offered to me and called my sister to find out where she was. She wasn’t expecting me for a while so she was a little shocked when I called her. We stretched out and went to starbucks for coffee and tea. We had a couple hours before my Aunt was expected to finish her race so we walked around the Finisher’s Village. There were tents for the special groups and sponsors. You couldn’t miss the Michelobe Ultra tent if you tried. lol. We decided to go to finish line and watch the racers come in. I was very inspired by the marathoners crossing the finish line. 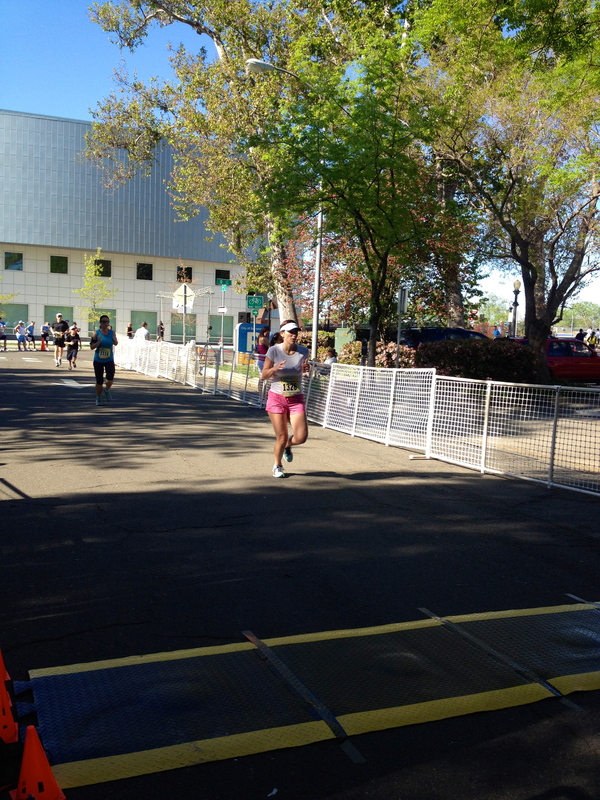 Many had big smiles on their faces as they crossed that finish line. I loved how many of the spectators cheered all of the runners on at the end. There was just so much positive energy and excitement. I was impressed by those that did the Boston to Big Sur. I really can’t imagine running one marathon and then running a second one only 13 days later :-/ We were trying to catch our Aunt coming across the finish line. We watched for two hours and then we started to think we must have missed her. My sister got a call from a local number it was my Aunt calling from someone’s phone. She had finished an hour earlier. lol. We met her at the Info booth. Obviously we didn’t have a post race meet up plan set up. We asked a volunteer to take a picture of us then headed out to lunch. I was starving! 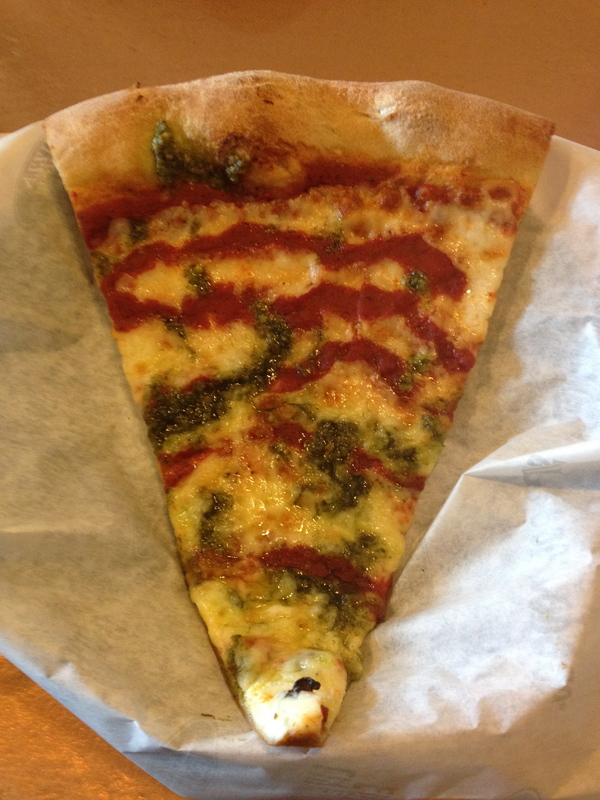 I decided to have 1 slice of pesto pizza as a treat. Then it was time to drive home. I had to fight falling asleep O_o I was sooo tired all the way home. Turbo Fire Day 70 – I did not get a chance to rest once I did get home. Ben went to run some errands which meant I had the boys to take care of and it was almost dinner time. I forced myself to do my Turbo Fire workout for the day. I kept it low impact on the fire drills for Fire30 but I gave the workout everything I had left. Stretch10 was great. My sore muscles enjoyed the extended stretch. M1: Whole Wheat Bagel Thin w/ Almond Butter and a banana. Zico to drink. Carried a 20 oz. bottle with Zico for my run. Stopped at the last 2 aid stations for water. M2: Half of a blueberry muffin and Starbucks Iced Green Tea/ Luna bar and Chocolate Zico. M3: 1 Slice of Pest Pizza from Pizza My Heart and a Chicken Walnut Salad. 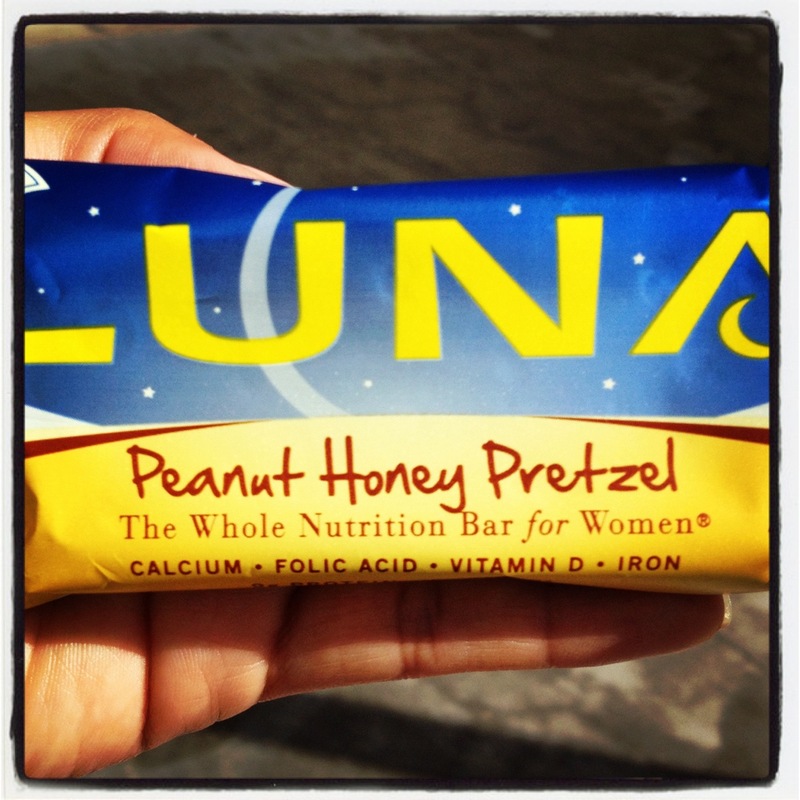 M4: Almond Coconut Kind bar – on the ride home. 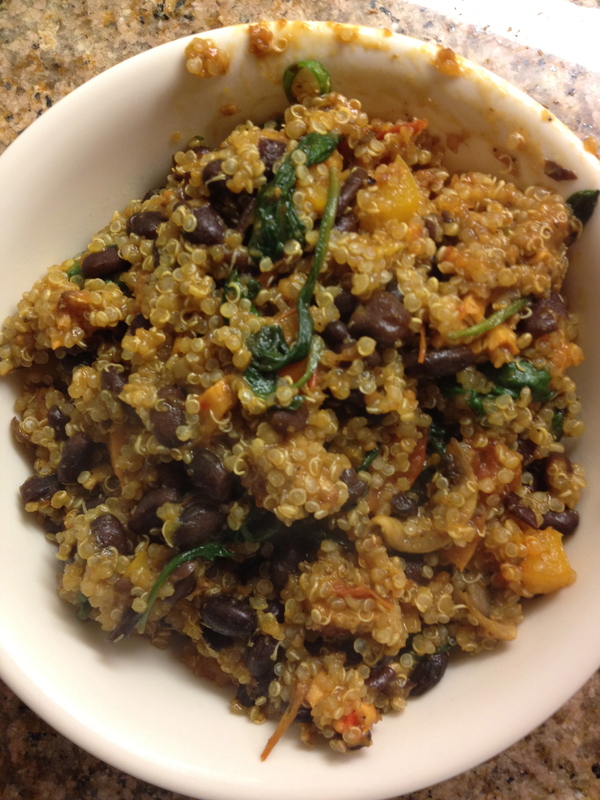 M5: Quinoa w/ turkey spinach red sauce. 60 oz. water and 3 Zicos. It’s not always easy to stay on track. Some days it’s really hard, like today. Ben brought came back with Taco Bell after going to the doctor’s office and boy was it tempting to have some of those yummy looking nachos!! Luckily I was able to keep myself busy by folding the mountain of laundry for the boys. It was out of necessity that I folded them because that was the only way I was going to find Gio’s uniform for his game. lol. For the most part, I’ve been able to stay away from fast foods since last August. 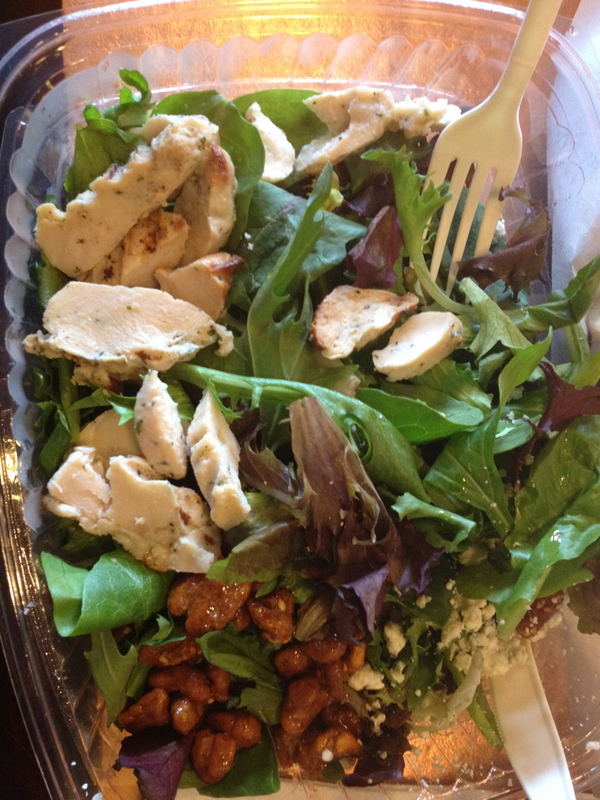 If I wind up at a fast food place, I will go for a salad if they have one, or I’ll just wait until I get home. Taco Bell was one of my favorites! Giving up fast foods was my choice and I believe that it has to be Ben’s choice in order for him to stick to it so I don’t force him to give it up. I do try my hardest to always have food at home, but I am not his mother and he is free to eat what he likes. Yes, this does cause friction at times, but we work through it. The junk food fest continued at dinner when he ordered pizza for him and the boys. I was pretty tired and could have easily pigged out. I wanted to. But I didn’t. Instead, I made myself my own food – which I do a lot. It would have been easier to just join the boys, but I know that I would have felt badly about it. I’m really glad that my will power was strong enough tonight :-) Another mental battle won! Afternoon workout: NTC Kickin’ It – Reached the 1250min SpitFire Badge!! I haven’t done an NTC workout in a while but it never fails to get me sweating. Looking forward to getting to 1500min so I can unlock the Jeanette Jenkins Ultimate Hollywood Workout. Also did Drop10 Leaner Loop. Went for an easy 30min jog before the sun went down. No head phones. It was nice to just run. Finished with a the same combo plank challenge I did last night: 25 pushups on my knees then 1min plank, 1min tummy tucks, 30 sec side plank each side, 1min tummy tucks and 1min plank. I really have no idea how I managed to do this because I was so tired. 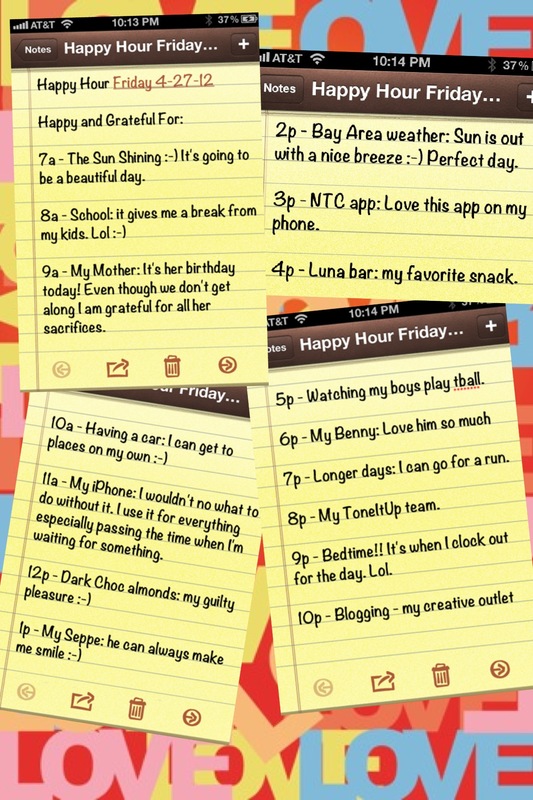 Today’s Tone It Up Calendar challenge for Happy Hour Friday was to write down 1 thing every hour that we are Grateful for or that makes us Happy. I really liked this idea since it makes us focus on the good things for a minute. I kept track on my iPhone from 7a – 10p. 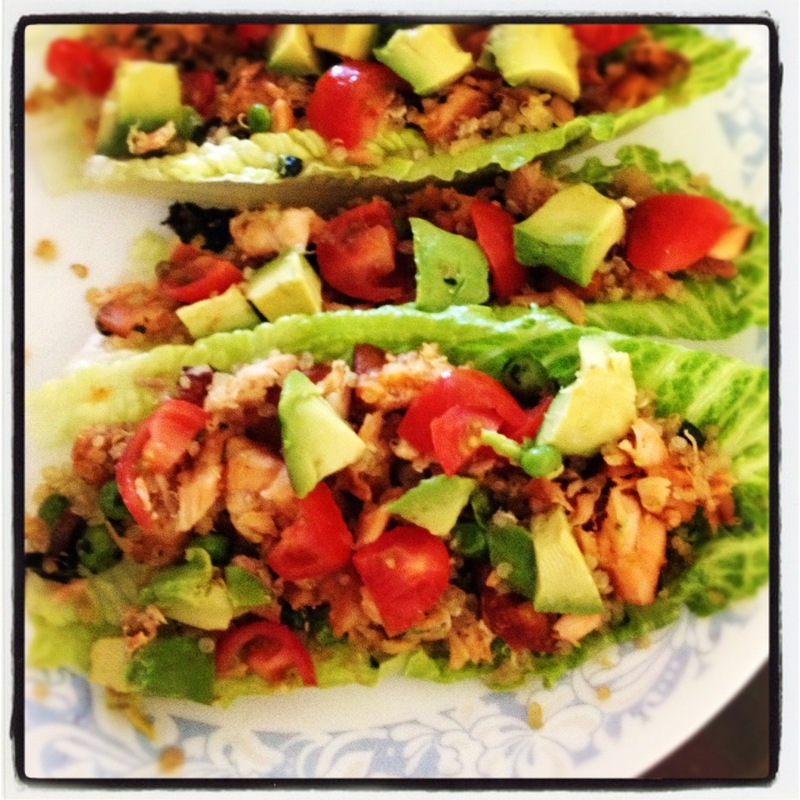 M3: Left over Salmon and Quinoa/peas mix wrapped in lettuce with fresh avocado and tomatoes. 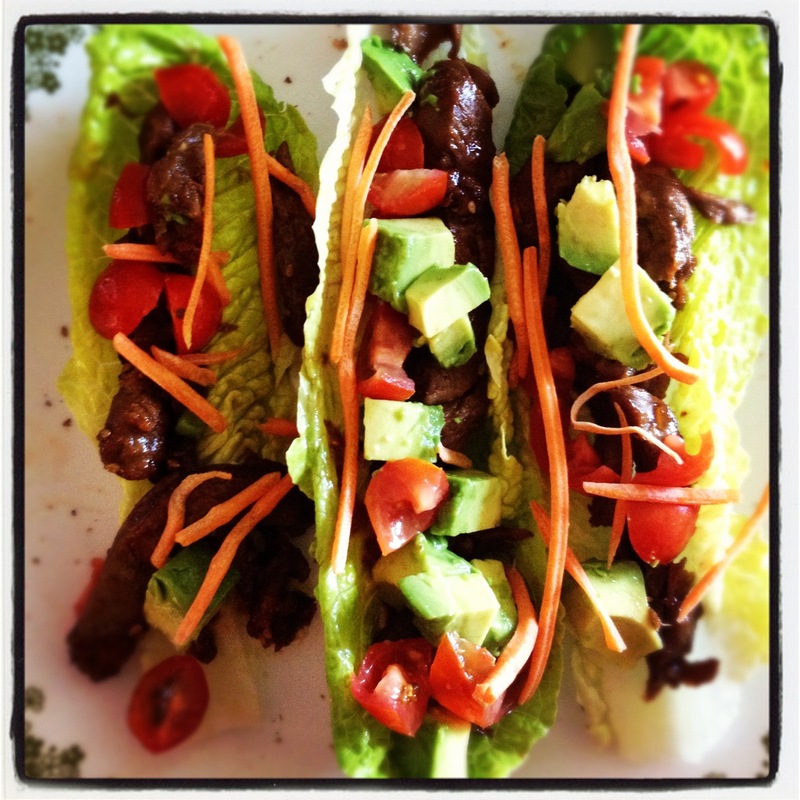 Made Left overs into Lettuce Wraps for lunch. 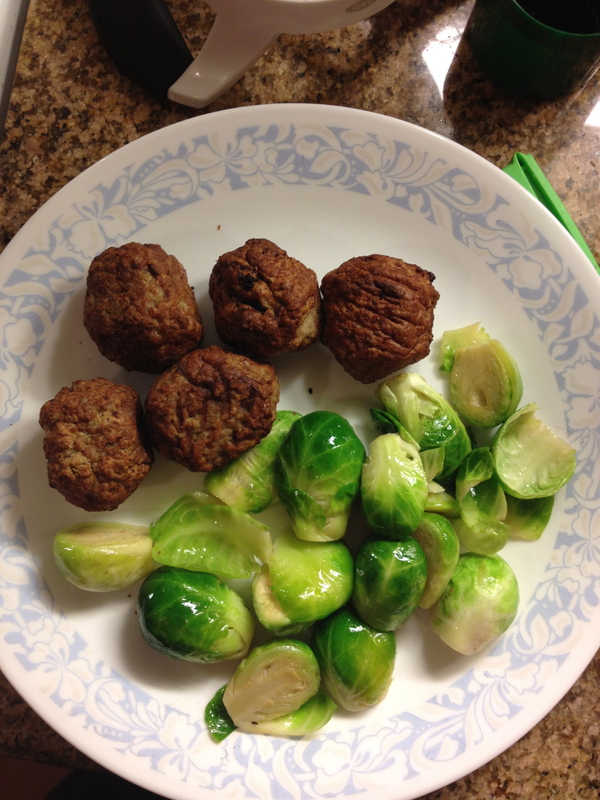 M5: Turkey Meatballs and Brussel Sprouts. Zico to drink. Turkey meatballs and brussels sprouts instead of pizza and bread sticks. 80 oz. of water 1 Zico. 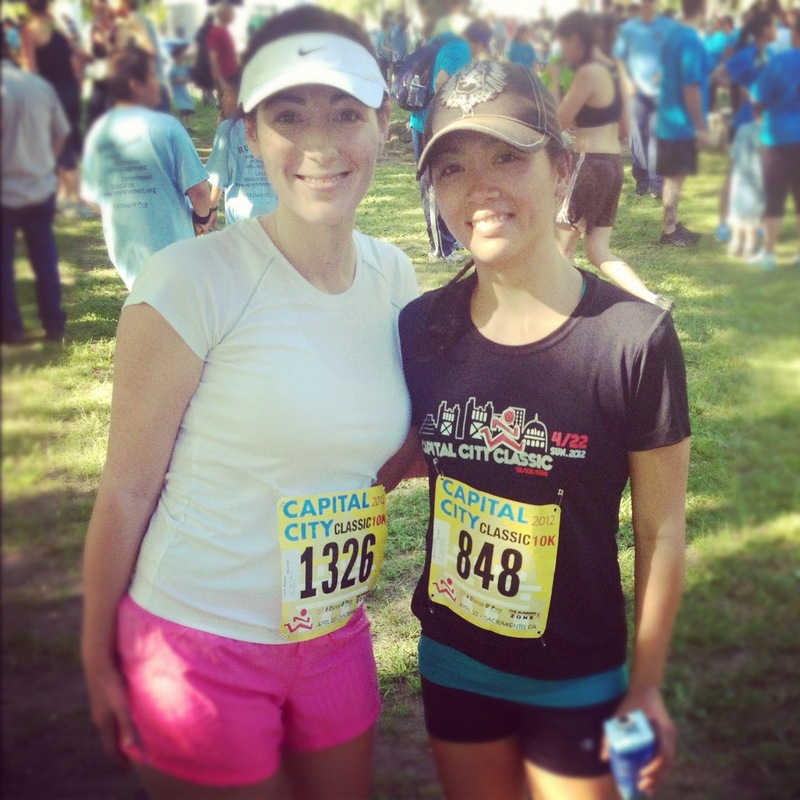 I signed up for the Capital City Classic 10K last minute. My friend Malissa was doing it so I decided to do it with her. I didn’t really train for it. 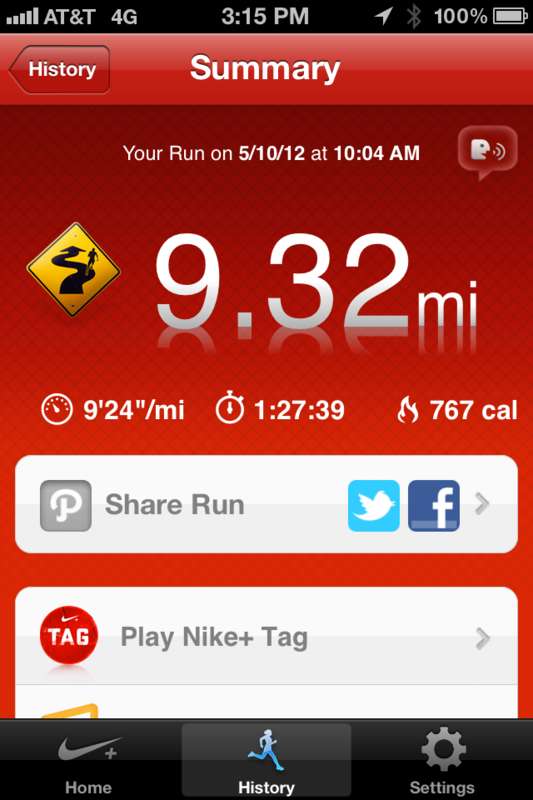 I’ve been focusing on my Big Sur training, but since I’ve been doing 9 mile runs, I figured that I could do 6 miles. I didn’t think I was all that nervous but I guess I was because I really didn’t sleep well the night before. It was also a very hot night. Despite that, I didn’t feel tired when I got up at 5a. We were staying at Ben’s mom’s house which was an hour away from where the race was being held. I got dressed and went down stairs to eat. I couldn’t have my usual whole wheat bagel, almond butter, and banana. Ben’s mom had whole grain bread, some peanut butter and strawberries. Hydrated with Zico. There was also a kids race that the boys could do. I didn’t sign them up before hand because I knew that there was a good chance that they would not want to do it. I was impressed that Gio got up at 5a and still wanted to go. Seppe on the other hand decided to stay with grandma and get some more sleep. Ben got up with us and did the driving. We didn’t leave until 6:15 but the way he drove, it only took 45min to get there. lol. I picked up my bib and shirt then registered Gio for his race. He was very happy to get a shirt and a bib. There was a kid’s play area with a bounce house and slide that Gio played on while we waited for my friend to get there. I used the restroom and put on my race shirt. 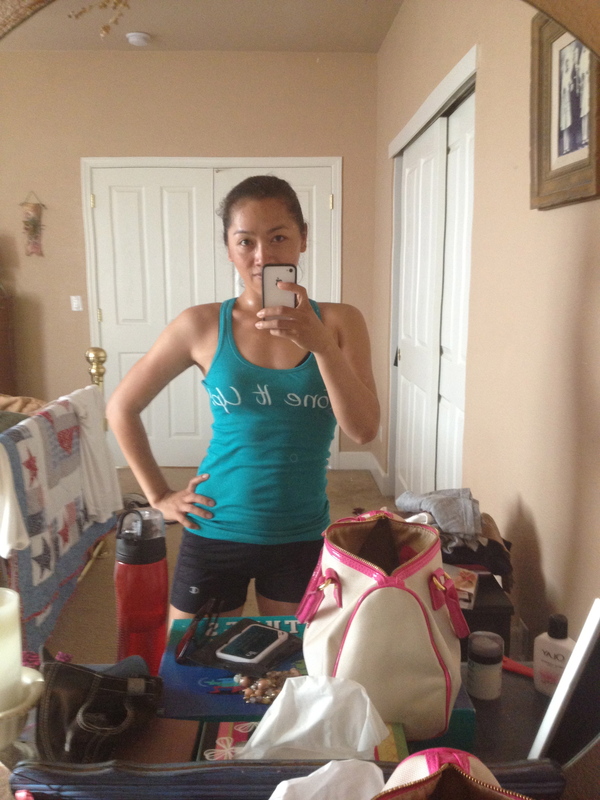 I was wearing my Tone It Up tank. I’d love to run with it, but I didn’t want to stick the pins in it so I threw the Tech shirt on top – in hindsight I should have taken the tank off because it was sooo hot! I had wanted to have my belt pack and phone with me, but since I forgot my belt, I couldn’t bring my phone on my run :-( I like to have my phone on me to map the route and I wanted to log the race into to my Nike+ app. Oh well – it was a naked run for me. Before the Race Not even 8a and it was already really bright and sunny! The one thing that I really didn’t like about the race was that it started Both the 5K and 10K at the same time – without any way of organizing those who were walking or running. There were A lot of kids there. 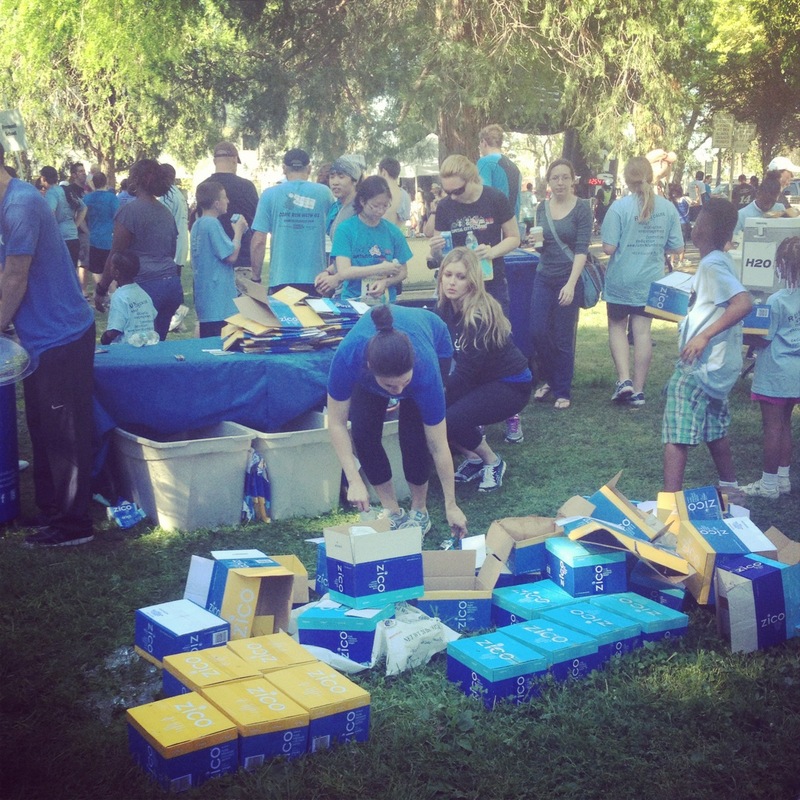 It looked like a bunch of schools got groups together to do the 5k run/walk. Nothing stopped them from going to the front of the line. I knew that none of them were going to be running fast enough. As soon as the announcer counted down and the crowd moved, it was task to weave through the kids. A bunch just stopped running right in front of us. grrrr!!! At 8a it was already hot. I wasn’t really prepared for the heat. I’m a little spoiled with the Bay Area weather. I usually always get a nice cool breeze during my runs and it’s never 80 degrees by 8a :-/ I had planned on also brining my water bottle, but that got forgotten as well – what happens when I’m in a rush. I stopped at all 3 aid stations. 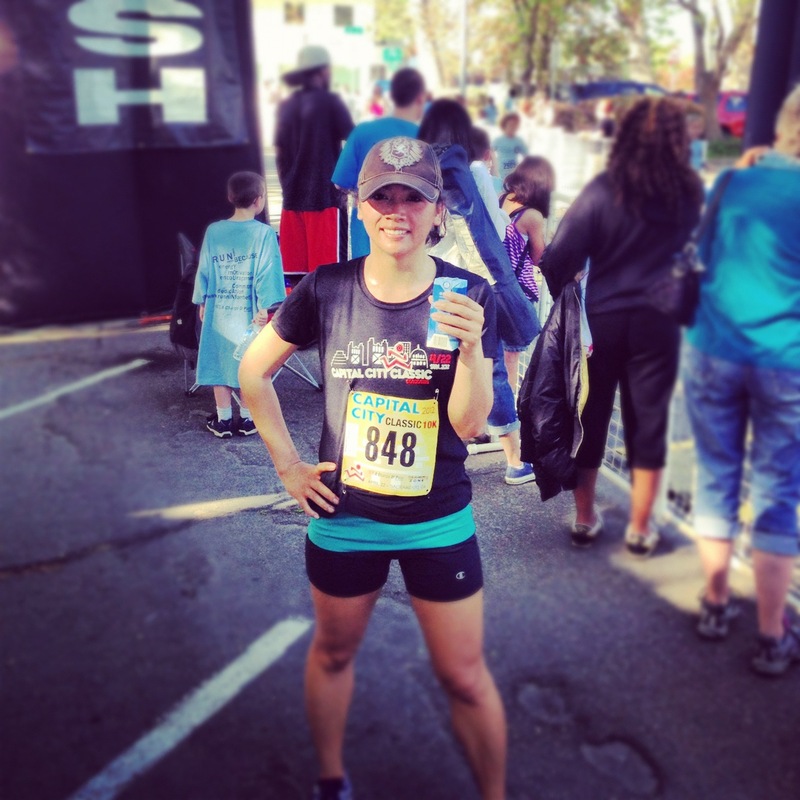 At the first one, I was handed some gatorade and tried to drink it while I jogged – FAIL!!! I spilled it all over me so I was sticky as well as sweaty. I slowed down and walked while I drank water at the other 2 stations. It was a nice run – very scenic. We ran by the Sacramento River and over the Tower Bridge. That was kind of cool because I’ve only ever driven over it. I welcomed every stretch of shade and dreaded all the open stretches in the blazing sun. There were even a few hills that were not fun but the few incline runs I did helped out. It was a lot less crowded once we separated from the 5k runners. Once we got to Old Sac, we were mixed back in with them. It was hard to weave through them because so many were walking. The last stretch had a hill thatI thought was just cruel. lol. I tried to sprint at the end but had to slow down several times because there were so many people walking in front of me. I almost ran right into a spectator crossing the street. Hydrating with Zico at the Finish line. But despite all that, I was able to beat my training time by 4 minutes!! My time 50:07. Not too bad, but I wasn’t thrilled about it. I think I could have done even better if I was able sprint as fast as I wanted to at the end. I’m pretty hard on myself. Ben said he was looking for me to take a picture but I ran right by him and he didn’t even realize it. lol. The heat really got to me because as soon as I stopped running, my head started hurting. I went straight to the Zico station to get some coconut water. I was thrilled that they were there. I love Zico!!! Ben handed me a Dark Chocolate and Cherry Kind bar and I ate that. I waited for my friend at the finish line and then we both went to Zico station and I grabbed another one. 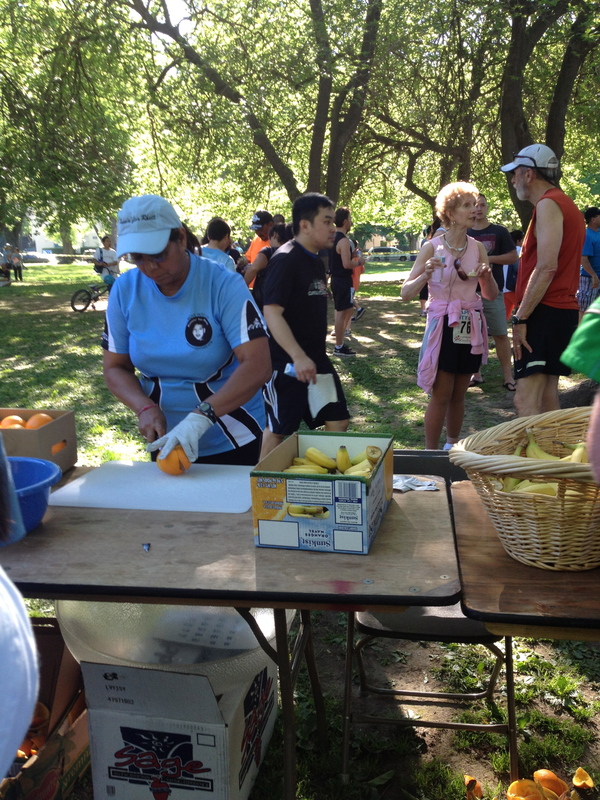 Snack Table - fruit, mini power bars, and bagels. She grabbed some of the snacks that were there for us. 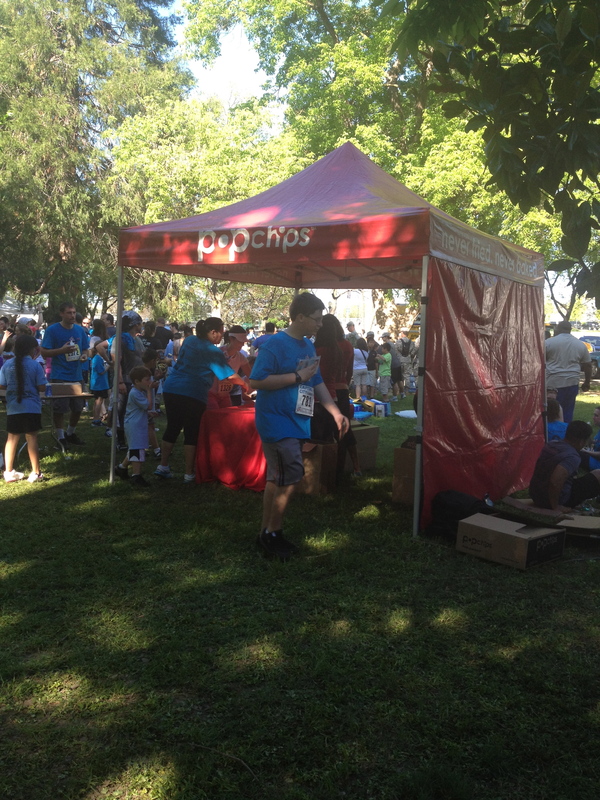 I skipped it and went to the PopChips tent and picked up some Sweet Potato and Parmesan Garlic. Yum! Then we waited for Gio’s race to start. He kept asking what time it was every minute. lol. He did not want to miss his race. There were 3 races – 1mile, 1/2mile, and 1/4mile. At first he was lined up for the mile, but got scared and decided to wait for the 1/2 mile. 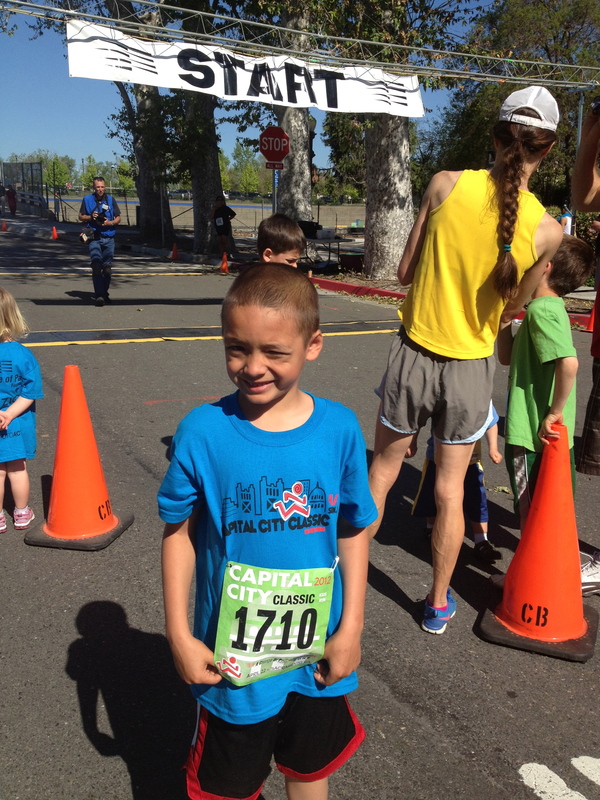 He was being very shy and did not want to be left alone at the start line. In the end, I had to run his race with him. He wanted me to hold his hand but I told him that I wouldn’t run with him if I had to hold his hand. 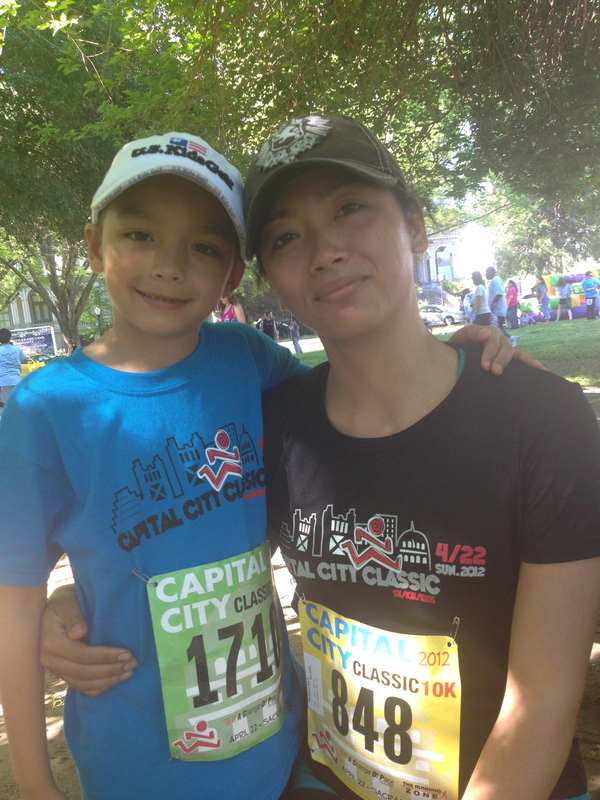 Me and my little runner before his race. At the start line. It was really hot by the time his race started. 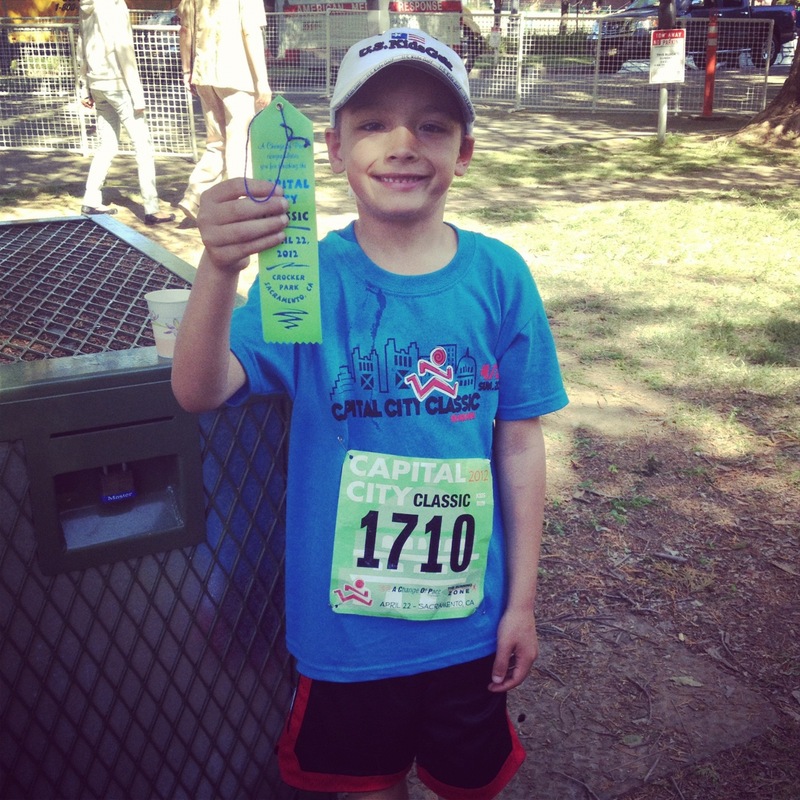 So proud of his ribbon for doing the 1/2 mile. All in all a good experience. My headache lasted most of the day though – even after taking a couple excedrin. After the race, we went back to his mom’s and had some lunch. It was such a hot day so the boys spent the day in the pool. After eating, I laid down for a nap. It was really hot so I didn’t sleep well, but I got enough to make my headache go away. 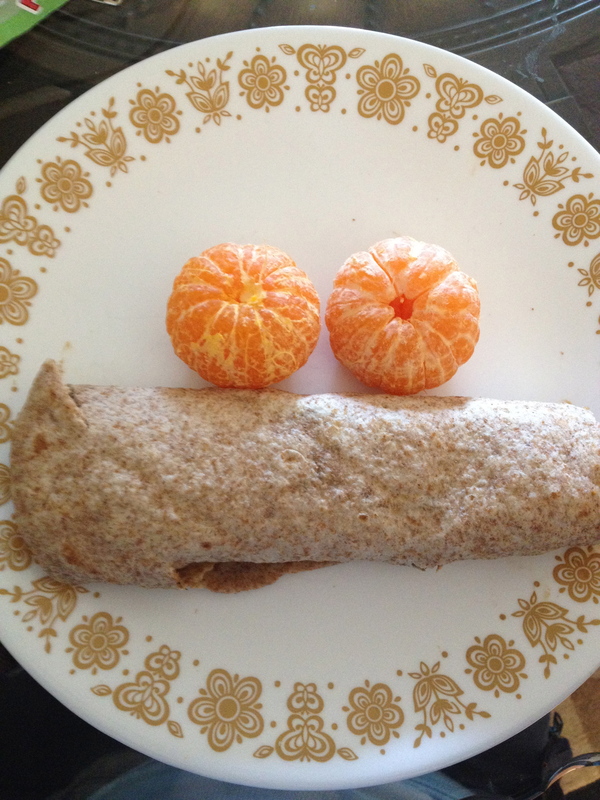 Turbo Fire Day65 – When I woke up, I had some fruit for a snack and then did my Fire30/Stretch10 workout. The boys were still in the pool so I as able to workout without any interruption. I was able to go all out on the Fire Drills. Since it was so hot, I was dripping with sweat the whole time. After having dinner it was time to drive home. After putting the boys to bed I did a 3 min plank with 1 min of tummy tucks before going to bed. I was very happy to be back home with wind and cooler weather. M1: Whole Grain toast w/ peanut butter and 3 strawberries. Zico to drink. 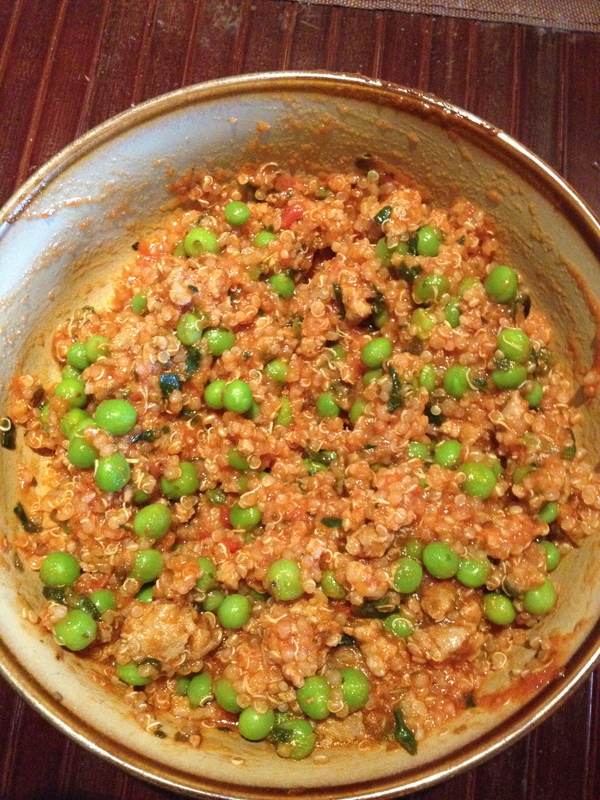 M3: Chicken w/ brown rice. 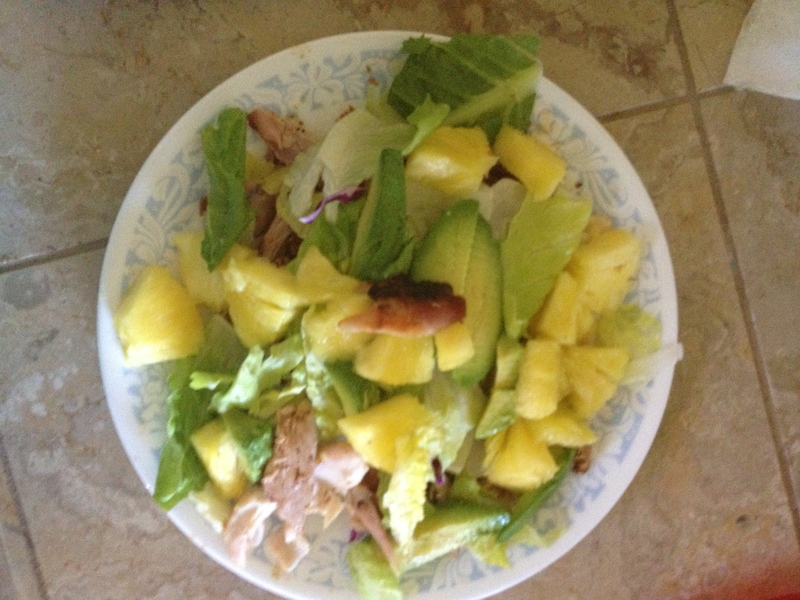 M5: Chicken salad with pineapple and avocado. BBQ chicken with lots of fresh pineapple, avocado, and lettuce. No dressing needed. 60 oz. of water and 3 Zicos. Run Longer, Run Faster, Train Harder...Challenge Yourself and Get Stronger! How to Live a Healthy Lifestyle! Where free spirit meets gluten-free domesticity.